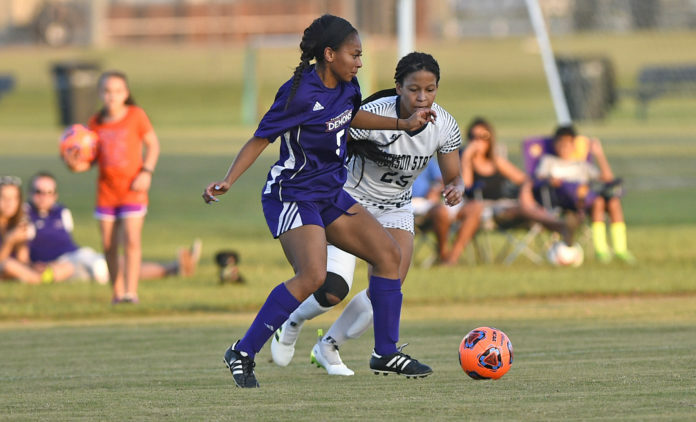 Northwestern State soccer freshman Skylar Sorrell leapt into the air, throwing NSU’s trademark “Fork’Em” sign while attempting to keep her hair perfectly in place. Lady Demon teammates laughed and made suggestions at the photo shoot, all part of NSU soccer’s report day Tuesday as the team prepares to kick off fall camp. Sorrell is one of 13 new faces on the roster, not including two new co-head coaches Jess and Anna Jobe. Jess Jobe appreciates the new energy these players will bring, blending in with a veteran bunch led by long-time starters like Brittany Caserma, Ysmina Smith and April Trowbridge. “We’ve got a great group of returners who are motivated, and we’re really happy with the progress this spring,” Jess Jobe said. “Anna and I got our head coaching wings under us and spending time with us this spring was tremendously important. The Jobes kick off their collegiate head coaching careers Aug. 17 at home against UT-San Antonio at 7 p.m. Jess and Anna were hired in December after serving on the Dallas Baptist staff most recently. “It feels good to start our season at home,” said Smith, who has started on the back line since her freshman season. “I love our field and our atmosphere, and it’s important to us to play our first game of the season in front of our own fans. Trowbridge, who was the 2016 Southland Conference Newcomer of the Year, will be in the middle of directing traffic and helping new players get in the proper position. “This spring, we really built on culture and the foundation of the spring,” “So we want to incorporate the freshmen into that and continue to build and get better. NSU plays six of its first nine games at home this season as fans can will get plenty of chances to see the Lady Demons in action. After the Aug. 17 opener and a three-game road swing, NSU returns for a five-game home stand against ULM (Sept. 2), Southern (Sept. 7), Jackson State (Sept. 9), Stephen F. Austin (Sept. 14) and LSU-Alexandria (Sept. 16).